A couple of years ago we couldn’t find our trusty box of Christmas decorations. The box was stuffed in a remote corner of our loft, which isn’t boarded and is filled with all kinds of rubbish; trying to retrieve anything is the suburban equivalent of Indiana Jones and the Temple of Doom. So as 25 December rolled towards us and we didn’t have as much a scrawny string of tinsel above the fireplace, I picked up a couple of cutprice bargain bin decorations from Focus DIY. I think this felt hanging decoration was about £1. As you can see, it’s a novelty advent calendar: the little Father Christmases and stockings all have numbers painted on in gold. We’re a bit old for advent calendars, but at least it added a little festive cheer to the sitting room. Earlier this month I strung up the decoration and didn’t think anything more of it. My husband, however, had other ideas… He went and filled every little pocket with a present for me! The first I knew about it was when he told me to go and empty Stocking No. 1. They are small, cheapie presents. So far I have had a multi-flavoured selection of Lindt Lindor chocolates (my favourites), mini notebooks (useful), a slug of sloe gin, a funny pen and a couple of keyrings, amongst other things. In the run-up to Christmas my husband and I are both working long hours, so we aren’t seeing very much of one another. (In fact at the time of writing – a Sunday afternoon – he is once again at work.) I love what he has done: the booty is fun, but the time, effort and thought that have gone into it are what cheer me up every morning when I find out what I have for the day. My surprise advent calendar makes me happy! Good morning Miss Thirfty. 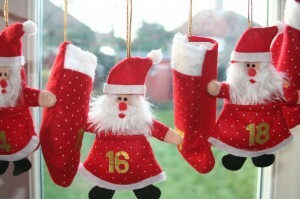 Lovely Xmassy post about the Advent Calendars. Daily gifts from your Advent Calendar is a strong German tradition. Although we’re English we’ve lived in Berlin for donkey’s years and love the rustic kitsch of German Advent. Xmas really starts here on the first Advent Sunday (in November!) Such calendars are in everyone’s home (except ours – just too much to do at this time of year alas!) and then to go with them, delicious home-made biscuits and coffee consumed around the table with family and guests in front of pretty candles. Actually, come to think of it, the Germans do Christmas in charming old-world style. Wish I had a useful thrifty-style comment to add here – ‘fraid I’ll just have to stick to seasonal good wishes. Am so pleased I found your site. Mr Thrifty didn’t come out the bargain bin did he? How lovely. Let’s start a trend for Ho, Ho Husbands (much better than those Ho Ho houses!) Merry Christmas! Yep, I love it! Had a miniature bottle of brandy yesterday and a packet of chewing gum today. Cheers me up every morning.